Space shuttle Discovery is closing in on theInternational Space Station without a working main antenna dish, but NASA saidits seven-astronaut crew should have no problems docking at the orbitinglaboratory early Wednesday. 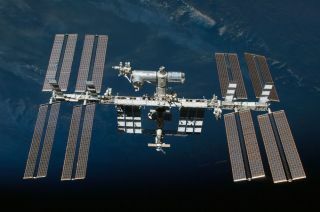 Discovery is due to arrive at thespace station at 3:44 a.m. EDT (0744 GMT) to begin nine dockeddays delivering fresh supplies, new science equipment and spare parts to thenearly complete orbiting laboratory. Since Discovery?s main antenna dish ? which pulls doubleduty as a docking radar ? is broken, the astronauts will have to rely on startrackers and other tools to keep track of their position as they pull up to thehulking, 800,000-pound (362,873-kg) space station. It?s a scenario the shuttleastronauts are trained for, but one that hasn?t happened in flight ina decade. ?It?s just a great day to be in space and we?re reallylooking forward to joining up with the International Space Station today,?Dutton said. Discovery?s astronauts are working an overnight shiftduring their 13-day mission. They launchedinto orbit early Monday. Discovery?sfailed antenna, which relays Ku-band signals to MissionControl, has forced the shuttle astronauts to work without the ability to beamtelevision signals to Earth or receive large files, e-mail and transfer anylarge amounts of data. On Tuesday, the astronauts had to store 40 gigabytes ofdata recorded from a standard inspection of Discovery?s heat shield so it canbe beamed to Earth tomorrow from computers onboard the space station. During tonight?s docking, the antenna is also expected tobe out of commission as a radar ranging tool that is typically used updateastronauts on their shuttle?s precise position as it nears the station. Theglitch has occurred on at least two other shuttle missions in the past, mostrecently in 2000 on NASA?s STS-92 mission ? one of the early space stationconstruction flights. ?We have real flight experience with this,? NASA?s spaceshuttle program manager LeRoy Cain told reporters late Tuesday. ?It?s part ofthe crew?s normal training template to train this event.? Discovery?s crew has hand-held laser ranging devices, rendezvoussensors and a trajectory control system in addition to the star trackers andnon-functioning antenna for docking assistance, he said. Before Discovery docks at the space station, shuttlecommander Alan Poindexter will fly the 100-ton spacecraft through an orbitalback flip so astronauts inside the space station can snap high-resolutionphotos of the shuttle?s tile-covered underbelly. Those photos will be beamed to Mission Control foranalysis to help engineers determine the health of Discovery?s heat shield.Like the Tuesday inspection by Discovery?s crew, the station photos are asafety measure instituted after the 2003 Columbia disaster to make sure ashuttle?s heat shield is intact and safe for the return through Earth?s atmosphere. Cain said NASA cameras did spot what appeared to be aheat-resistant tile falling from Discovery?s tail during its launch into spaceon Monday. Video of the shuttle?s ascent show an object appearing tofall from the left side of the tail-mounted speed brake about 42 seconds afterliftoff. Discovery was zooming spaceward at Mach 1 at the time. ?Preliminarily, I don?t believe this will be any impactfor us,? Cain said, adding that engineers will complete a full analysis anyway. "This is going to turn out to be a non issue for us, is what Iexpect." Discovery?s seven-astronaut crew are flying NASA?sfourth-to-last shuttle mission before the fleet is due to be retired in thefall. When the shuttle arrives at the space station, its sevenastronauts will temporarily boost the station?s population up to 13 people ?tying the all-time record for largest group in space. There are threewomen aboard Discovery and one living on the space station tomake four in all. When the shuttle docks, it will be the first time that manywill be together in orbit at the same time. SPACE.com is providing complete coverage ofDiscovery's STS-131 mission to the International Space Station with ManagingEditor Tariq Malik and Staff Writer Clara Moskowitz based in New York. Click here for shuttle missionupdates and a link to NASA TV.